NOTE: It would take a 7 foot thick piece of insulation to even get close to this protection! Radiant barrier was first introduced in the United States 1920’s. 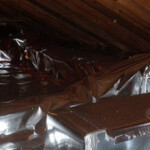 It was actually used to insulate homes and commercial buildings. In 1945, the manufacturer was ruled a monopoly by the government and shut down! In 1955, NASA put it to use for the space program. Not only does a top-quality radiant barrier have the ability to keep 95% of the radiated heat out, but it can also keep in 50-75% of your winter heating. Plus, it will last a lifetime! Fill out the form to the right, and we will contact you as soon as possible to schedule your free estimate! The estimate we give you will be good for an entire 12 months.